Ed. Note- We continue our month-long look at the top football recruits in Massachusetts with a profile of Boston College bound tight end Jake Burt. 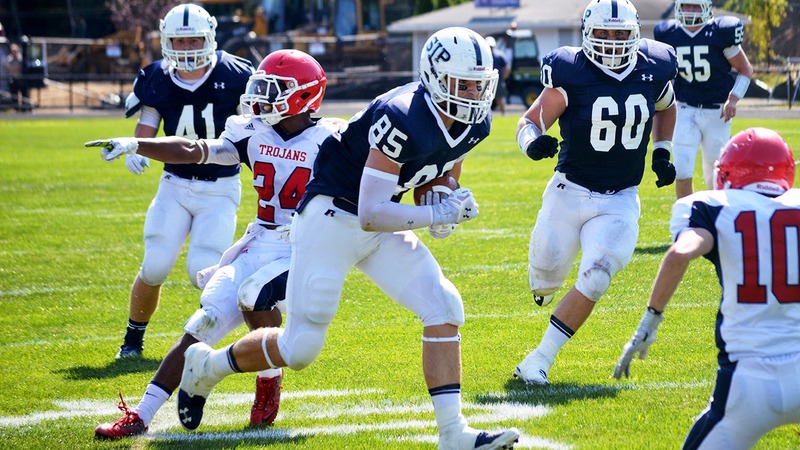 Mike Uva, a St. John's Prep alum himself, has more on the SJP tight end, who excels as a receiver, thanks to translating his basketball skills to the gridiron. At 6-foot-5, 230-pounds, it wasn’t hard to spot Burt on the field. He was a vital part of the Prep offense and allowed the Eagles to add new wrinkles to their passing attack each week. The most evident part of Burt’s game is how he translates his basketball skills from the court to the field. Whether the offense is in the red zone or at midfield, Burt attacks the ball like a center going for a rebound every time. His large frame makes it easy to box out smaller defenders, and with his massive hands he hardly drops any passes that come his way. Although at St. John’s Prep Burt was used occasionally to block in the run game, it’s an area he’ll need to improve on heading to Boston College. With the success BC has had running the football the past two seasons, Burt will need to prove to the coaching staff he’s capable of going up against bigger defensive linemen and linebackers. He’ll also need to gain more speed, not only to help with route running but also for down field blocking as well. Boston College is known for redshirting their lineman and, though Burt is a tight end, look for BC to treat him the same way. An extra year learning the offense and filling out in the weight room should increase Burt’s value down the road.